If you are ever in a creative meeting you will hear talented people talking about color pallets, color psychology, and color theory. If you are a decision maker, there is something fundamentally important about understanding color theory. 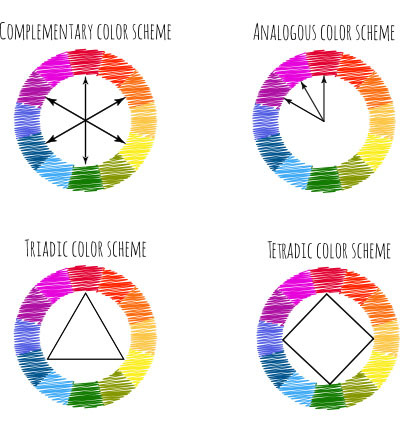 A quick Google search on color theory will turn up long-winded, self-indulging articles that try to explain it in a way that is overly complicated. However, on the surface, color theory is quite simple, and we want our clients (especially those that have a difficult time matching the color of their clothes) to understand the main reasons we propose particular color pallets. White and black should not be considered colors. White is the combination of all colors and black is the absence of colors. Understanding this makes the rest of this blog easier to follow. Yes, we know CMYK can consider black a pigment. We know RGB is additive, and CMYK is subtractive, but we are writing this article for simplicity so let's just assume white and black are not colors, OK? Red, blue, and yellow are the "primary" colors or "source" colors. They are primary because they can not be made by mixing any other colors. They also do not contain any elements of any of the other primary colors. They are the color originators. 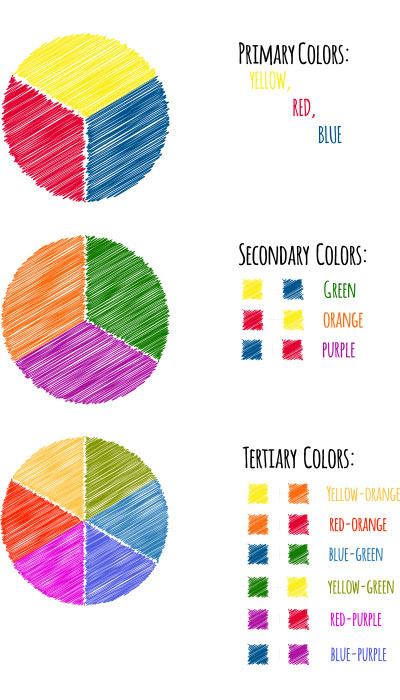 Mixing the primary and secondary colors results in the tertiary colors. Hue: The shade of the color. Saturation: The intensity of the color. Saturation cannot exist without hues. Value: The lightness or darkness of a color. Hues cannot exist without saturation. Warm colors: Colors made from the reds, oranges, and yellows. Color psychology would have you believe that they convey feelings of happiness and optimism. Cool colors: Colors made from the blue and green side of the color wheel. They may convey feelings of calmness or sadness. As a side note, hues can also affect whether a color is considered warm or cool, and grey tones can be described as cool or warm depending on which part of the color wheel they lean. The color wheel is used to see colors in action and to understand the relationships color theory defines. Monochromatic Pallets: A single color that has different shades of that color from lighter to darker. Analogous Pallets: Composed of three, four, or five adjacent hues on the color wheel. Triadic Pallets: Made of three colors equally spaced apart on the color wheel. Complementary Pallets: Made of colors that are directly opposite of each other on the color wheel. Tetradic Pallets: Four colors equally spaced apart on the color wheel. Ok, things get much more complicated from here. Each of the different types of pallets creates and conveys different emotions. However, if you apply colors in these fashions, you can mostly be assured they will work together. While this simplistic view can help you understand the color choices graphic design and creative design teams make, our team of experts take it a step further and select the right colors for different applications. Specific colors are better in print than in digital, and even make a difference on mobile versus desktop websites. Now you have the basic knowledge to sit with creative people and debate colors.